Today is Day One of Vintage Week at Not Dressed As Lamb: throughout the week I’ll be sharing some outfits I’ve styled that include some proper vintage pieces, and on Sunday there’ll be a post sharing some Top Tips for Buying Vintage and an interview with the owner of Scarlet Vintage in Bath (one of my current sponsors). So I’ve collaborated with Scarlet Vintage this week, who have very kindly loaned me several pieces to style on the blog, in the hopes that I can prove you don’t have to look like a museum piece or as if you’re on your way to a fancy dress party when you wear vintage! There are many great vintage-loving bloggers out there at the moment who absolutely rock a full-on retro look, but if you’re wanting to try vintage and are nervous about looking too retro, it’s better to go for one piece at a time and work them seamlessly into your existing wardrobe. 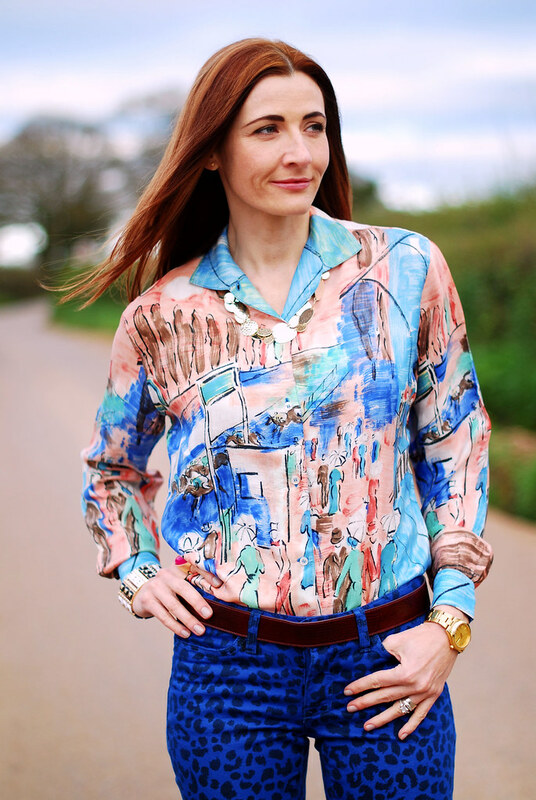 I chose this gorgeous 1950s silk patterned shirt because of its beautiful colours, and the pattern is very reminiscent of kitsch paintings I remember seeing as a kid – this one is a horse racing scene with abstract figures (very typical of the time). My tip for wearing vintage is to avoid wearing other pieces that are typical of the same period, so I paired the shirt with leopard print skinnies and a sharp white jacket – both very 2010s. The pattern-mixing brings the outfit right up-to-date, and the white jacket tones down the loud pattern. A few pieces of contemporary jewellery and some bright heels result in a modern look incorporating a 60 year old shirt – I don’t think you’d know realise at all looking at the outfit that I was wearing vintage. So as an example, if you wear a vintage 1950s piece, I would avoid full midi skirts, short cropped cardigans, even your hair set in waves, etc. if you want to avoid a full-on retro look. In the same way, I wouldn’t wear my 1970s massive-collared shirt with flared jeans or my hair straightened and in a centre parting (as here) for the same reason. That said, I love a retro look so how far you take it is up to you! Do you have a favourite vintage piece? Do you find styling it easy or somewhat difficult…? Killer colour combination on you! I love the whole look and I totally agree about mixing vintage and modern for a fresh style. I think a lot of people are nervous about vintage because they think they will look costume-y and it doesn't have to be that way. WOW! This is possibly my fav look of yours yet! Love, love, LOVE this vintage blouse! 🙂 Looking forward to your upcoming posts on vintage! 🙂 XOXO! It's interesting to have lived through the decades and seen vintage print trends firsthand, then compare what was with current revivals. It's especially nice to see the take new fabric designers have taken on water-color and Asian themes. Two of my faves from my childhood. Lovely job with this blouse, and I'm happy to see you advise mixing contemporary and vintage … makes everything more interesting to look at! That vintage shirt is pretty fabulous on you. What a score! those jeggings are fabulous! all the color and prints are amazing on you! Love the way you mix your prints lovely! 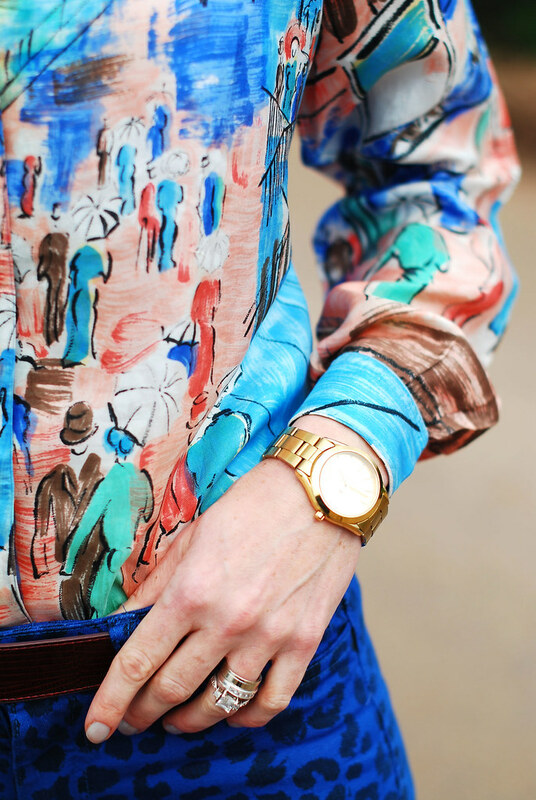 Vintage printed silk blouse, NOT polyester!!! I stopped breathing for a second there! Gorgeous, gorgeous, GORGEOUS! You did a bang-up job styling it! I love this! The way you mix your prints it pure magic! great color combo! love those pants and the shirt tucked in with a blazer! darling! Great jeggings…. 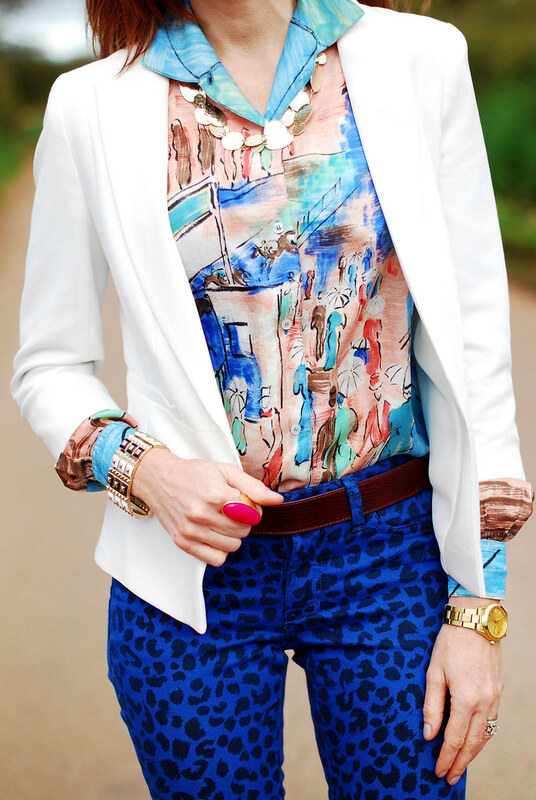 love the cobalt leopard print. Hope your having a great day Catherine.